Last Saturday I woke up to the gloomiest skies ever, with NoTwitterTodd lying beside me for the first weekend in ages. I was torn. Drive to Livermore and run a half marathon in the rain, or stay home and spend some quality time with my love? Luckily, this love of mine is also very encouraging. He nudged me to get out there, rain or shine, to earn my bling and have fun with my friends. And that's exactly what I did! The drive to Livermore is only about 45 minutes for me (with no traffic). Since the race started at 8:00am, I had plenty of time to get myself together and stop off at my favorite Starbucks for coffee and a bagel. I got to Livermore about 40 minutes before race time, and met up with my friend Christine (who was sweet enough to pick up our bibs the day before). We waited on our friend Francis and pretty soon the three of us were ready to run! The forecast called for rain showers to begin at 8:00am - 12:00pm, but luckily that didn't happen. As we started running, the rain stayed away and instead we felt a touch of humidity in the air. 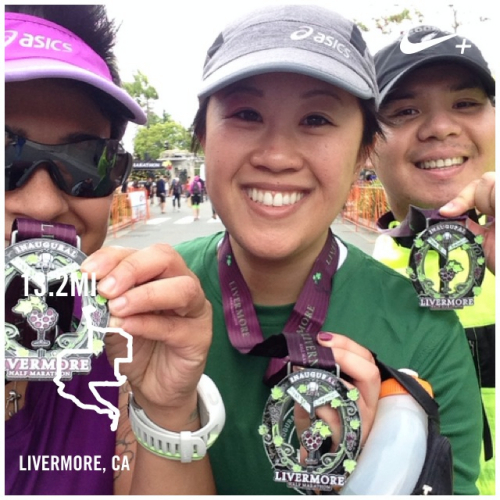 We shed off our jackets, enjoyed the cool breeze and set off on our 13.1 mile journey through beautiful Livermore. We started in Downtown Livermore, then ran through a very nice residential area for about 3 miles. Just before mile four, we turned off the main road & ran along the Arroyo Del Valle Regional Trail for the next couple of miles. I really loved this trail! It reminded me so much of the Coyote Creek trail that I run at home. Further research into the Arroyo Del Valle trail led me to the Del Valle Regional Park website, which looks like a great local spot for camping and outdoor fun. I'll have to come back for a visit and explore more of these awesome trails. The course also took us passed several wineries with gorgeous grape vines as far as the eyes could see. There were several race photographers along the course and we made sure to strike a pose often. As we ran away from Wente Vineyards, we climbed a hill that overlooked the valley below. The contrast between the grey sky and bright green landscape was strikingly beautiful. Although the course wasn't thrilling, it was peaceful and lovely. The hills were gentle rolling hills, and there were not many of them. Although we were walking more than we were running, this would have been a great course to attempt a PR. I only have my own lack of training to blame for my race results. This race inspired me to make the time for short runs and speed work. I need it. Running with these 2 crazy cats made this race extra-special. We had 3 hours to chat, catch-up, share running experiences, talk about future races and our favorite places to eat. I've said it once and I will say it again, the friends I've made via running outweigh all the medals hanging in my house. Because we had walked so much, we fell off pace and had to scramble along the crowded downtown sidewalk to find the finish line. It was hilarious! Finally, we did cross the finish line and we got our bling. And then came the wine! Wine glass, wine, doughnut, medal. Yup - I'm happy. As part of our race entry fee, we received a medal, a commemorative wine glass, a race tee, a ticket for a doughnut and entry into the post-race party area complete with multiple wineries, beer and a live band. Awesome! Post-race festival area. Wine everywhere! And then champagne happened! And it was good. Yum! Strike beer from San Jose! Francis discovered the Strike beer tent, and the race gals gave us extra doughnuts as they closed up shop. So I grabbed a bench and went back to snacking. Beer and doughnuts!? Yup. Just call me Homer Simpson. A little after noon, just as the post-race party was ending, the predicted rain showed up. Just in time! We couldn't have planned this any better. Would I run this race again? Yes! In a heartbeat. Although, due to rising costs of race entries and my own budgetary restraints, I am trying hard to not repeat races - I would run Livermore again. It was very well organized, the town had a sweet vibe, the course was beautiful and the price was right. This race cost me less than $70. Seriously. And, the wine glass can be used at future events in Downtown Livermore. The real icing on the cake? 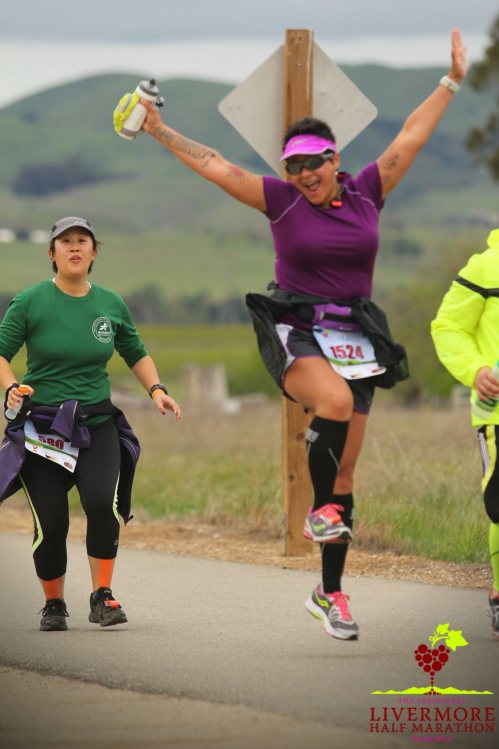 I had no idea the race photos were also included in our registration price. That was a huge surprise to me. Other race organizations should take note. Bib, shirt, glass, medal. Nicely done, Livermore! Another neat little perk - I was able to request a number to add to my bib during registration. You'll see the number 19 printed just below the main bib number. 19 is NoTwitterTodd's number, and one of the coolest numbers in motocross. You can read all about my love and the number 19 right here. I wanted the number on my bib to run in support of him and his dad who has been sick since the start of this year. It was my own personalized #run3rd bib. I really loved that little detail! 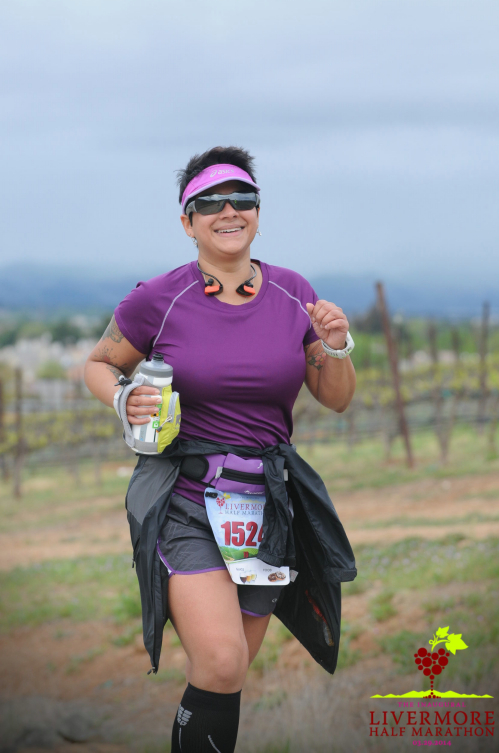 My next local race is the Bulldog Fun Run on Saturday, May 17th in Morgan Hill. The race benefits the Ann Sobrato High School Cheer Team. I hope to see you there, and if you can't make it - please consider being a sponsor. Let's keep on keeping it local!